At cognitiveSEO, we are always trying to make our user’s experience as good as possible and be of a real help to our customer’s businesses. This is why we put in a lot of working hours in improving the toolset. This update improves the functionality of the Unnatural Link Detection Tool by simplifying the old interface and adding a few more in-depth analysis charts that will give you a clear picture on why your site might be penalized or why it could be penalized in the future. Unnatural links are a big issue. A lot of sites were already penalized by Google for excessive unnatural linking. More will follow probably. Webmasters struggle to find the best means to identify the rotten apples in their garden while Google sharpens its weapons to catch “the enemy”. With Google Penguin 3.0 (based on the Matt Cutts’ numerotation … others would call it Google Penguin 6.0 ) lurking around the corner and the well-known search engine’s volatility, we are trying to always be one step ahead. We think that it is better to prevent than to treat and this is why we want to proudly announce some major improvements that we’ve made to our tool. The interface was simplified and all the functionality that could be found previously here is found in the Link Navigator, the tool that allows you to review all of the links and prepare the disavow of link removal campaign as quickly as possible. Identifying the unnatural links is great but wouldn’t be greater if you had the means to see in a well-organized list what are the most common issues of those unnatural links? Now, you have this possibility. We’ve created a great chart that indicates what are the most common unnatural link issues of yours or your competitor’s site. This great list give you the possibility to make an overall idea about a site’s main issues but also comes in hand when trying to find a “clean-up” strategy for your site. Over-optimization of targeted anchor text has been given a lot of importance, specially in a bid to avoid getting slapped by Google’s Penguin update. The Penguin update’s effects have been visible on many websites that have unnatural anchor text distribution. In a competitive market it is crucial to know what unnatural anchor text a site has. This is why we’ve created for you a chart of the Most Common Unnatural Anchor Text. This list offers you great hints about what your next moves should be and gives you a great overview of your site’s main issues. It’s never been easier to find out what are the top pages on a site the are most linked by unnatural or suspect links. We’ve created the Top Unnatural Linked Pages chart that helps you to find out in a flash the main domains or pages that might cause you the dreaded Google Penalty. Any site has, in different ratios, unnatural, suspect and ok links. It’s highly important to know which one are which but it is as important to have an overview about the historical evolution of the unnatural, suspect and ok links. Now, you can check this out in a blink, just by getting a glimpse of the weekly historical evolution of the unnatural, suspect and ok links. A highly recommended feature is the Unnatural Links E-mail Alerts, which sends you e-mail the moment it finds new unnatural links for your site ( or competitors’ site). 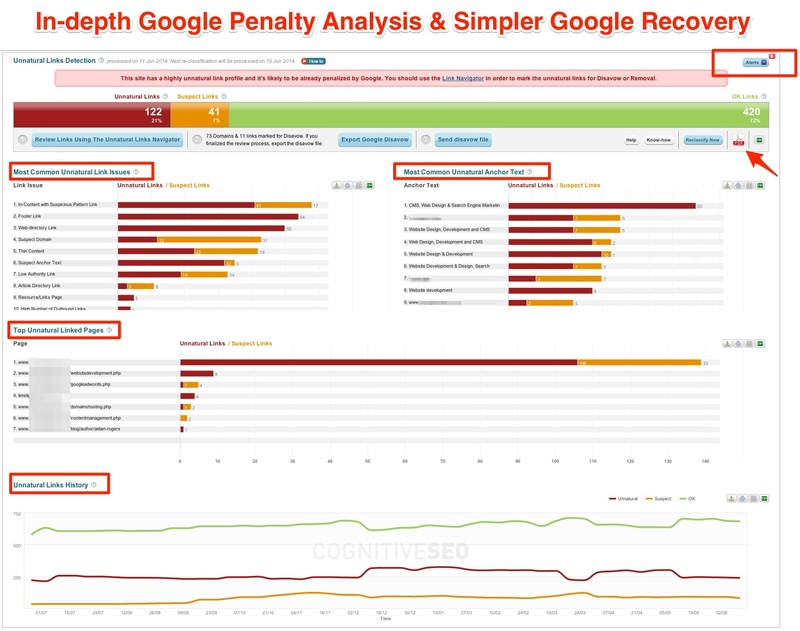 This feature allows you to stay up to date with the evolution of the Google Penalty Risk without the needs to constantly check your cognitiveSEO account. You will receive only the most important mails that matter to your business. 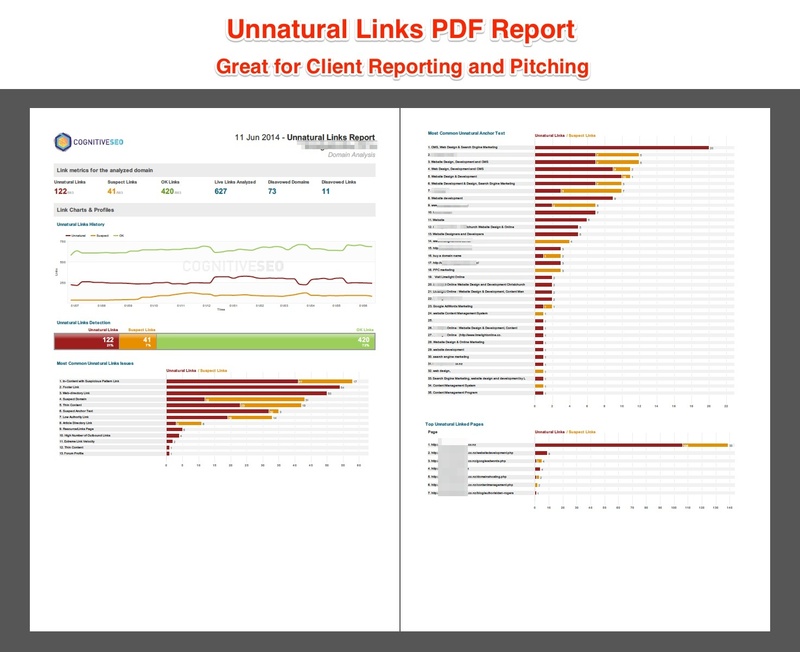 Whether you want to present the data and statistics to your clients or you want to present amazing pitches in order to get new clients, you can create a very comprehensive unnatural links PDF report with the most important information. The generated report can be white labeled with your own logo, if you need it. 8. In-Depth Documentation Guide on How to Best Use the Unnatural Link Detection Tool. Even if the tool is simple to use, there are a few things that you should know before using it in order to have the best experience and recover your site faster. We have wrote a very in-depth guide that includes both video tutorials and written documentation of each of the functionalities of the tool. You can access the unnatural links guide documentation here. You can also find a full documentation for the entire cognitiveSEO toolset on the support.cognitiveseo.com site. Even though you may see yourself as a true white hat SEO and you do everything by the book, you never know when you’re going to be under a negative SEO campaign siege or get hit by the dreaded Google Penguin 3.0 (or another unnatural links update). As Google constantly improves its algorithm you may never know when you end up on the wrong side of its Guidelines. That’s why you always have to be prepared by monitoring your link profile constantly. As the scout motto says “Be Prepared”, which means to always stay in a state of readiness so you can better react in troublesome situations. The Unnatural Link Detection Tool transforms the assiduous workload of monitoring link profiles and identifying unnatural links into a simple task. tks for the appreciation. it should do your job much easier and it should provide even more insight into the unnatural link issues of the sites you analyze. no one know when it is coming :). they released Penguin 1.0 and 2.0 with a 1 year frequency so that is why it could be the Penguin 3.0 could be launched around the same date. But it may not. This is not only for the Penguin 3.0 (even if the title refers to it) , it is for any site. Prevent and Protect is always better then Recover. looks good, i will try it soon. It is possibly to upload the disavow list, so these backlinks are not taken in account? This could help to fine tune a backlink profile. Do you actually believe that footer links are considered high risk links if they are not keyword rich but branded, endorsed, or cited? I think that it would be out of line to say that a footer link saying something like: “website built with pride by brandname” would be a high risk link. Not all footer links are high risk. I say this because in the footer area, it’s a place where a lot of trusted OBLS’s are placed by mega sites. Yes, the footer link placements have been abused through WordPress Theme Sponsoring and Web Design firms, I get it, but a trusted, endorsed footer link should not be considered high risk. Does your Link Detection determine the difference between a trusted footer link and a over optimized footer link? tks for the comment Joshua. Footer links, as any other links naturalness is about the context of the link in the big picture. What this means is the intent of the link being put there … in the footer in our case. It does not matter brand or commercial in terms of the anchor used. Exactly not all footer links, web-directory links, blogroll links etc are high risk links. It is about the quantified risk of the link. What is you have 40% of your links coming from the footer of other pages. They surely will raise a flag. This flag would not be raised if you would have had 0.5% footer links. The same for any others. And yes obviously the unnatural link detection tool in cognitiveSEO can understand the difference between a high risk and low risk link. And it also does a pretty good job at it 😉 ( I am biased obviously here) … just try it. Thanks for that Razvan, it makes sense. Some Web Design Firms (not all of them) do not have a clue about link building, Penguin, or even Panda for that matter. God help their clients… And so they are not really building links, but they ARE placing their links at the footer. This would make their footer density way above average due to ignorance. It’s these web design firms that are a high target I suppose. Hmmm, bummer for them. Hi When will be the Next Penquin Update in this Month ? no one knows when the update will hit. but surely it will. even if it will be named Tiger 1.0 … it will be a future update about unnatural links. It will definitely rain – that we can be sure of! Regarding the footer links, do you consider footer links that are set to ‘nofollow’ as at risk? Very informative and very helpful, worth sharing to others. Tiger 1.0 sounds scary to me. But like Razvan says we must all be ready. As always, great update to a great tool – one of many reasons why I choose this over other tools and why I always recommend it to anyone who needs this sort of tool. I myself have been predicting an impending update to Penguin soon, wouldn’t surprise me if it was in a month or two as we’re coming close to a year since the last official update! Very cool Razvan, its these little things that really help people like myself identify unnatural links and get the pesky things removed! Seems like a good product…should give it a try in a few weeks when my link campaign winds up. Thanks – Good too hear about safe nofollow footer links! Will 100% be diving into that unnatural link tool!